To understand the Class of Control mechanisms in Cisco’s Unified Communications Manager it’s vital that you understand Partitions and Calling Search Spaces. There are a number of analogies that can be drawn to illustrate the concept. I personally have found the analogies more complicated than just a simple explanation. A Partition is a container that contains “things”. Calling Search Spaces have, or do not have, the ability to “look into” these containers. These “things” are Directory Numbers, Route Patterns, Translation Patterns, and so on. A Calling Search Space is configured with a list of Partitions it can “look into”. So what does all of this mean? Let’s look at an example. As you noticed I prefer to use “PT” or “CSS” to indicate what the item is along with a somewhat descriptive name. If you have a test system you would like to follow along these configuration items are under the “Call Routing -> Class of Control” menu. First, find the DN’s and Route Patterns and change the Partition drop down to the options above. Four digit number are internal, seven are local and 10 are long distance. The DN’s and Route patterns can be found under the “Call Routing->Directory Numbers” and “Call Routing-> Route/Hunt-> Route Patterns” menus respectively. Next, as an example, let’s say we would like to create a Calling Search Space by the name “CSS-Local” with the ability to make calls to internal extensions as well as 7 digit local numbers. Navigate to “Call Routing -> Class of Control -> Calling Search Space” and add new. 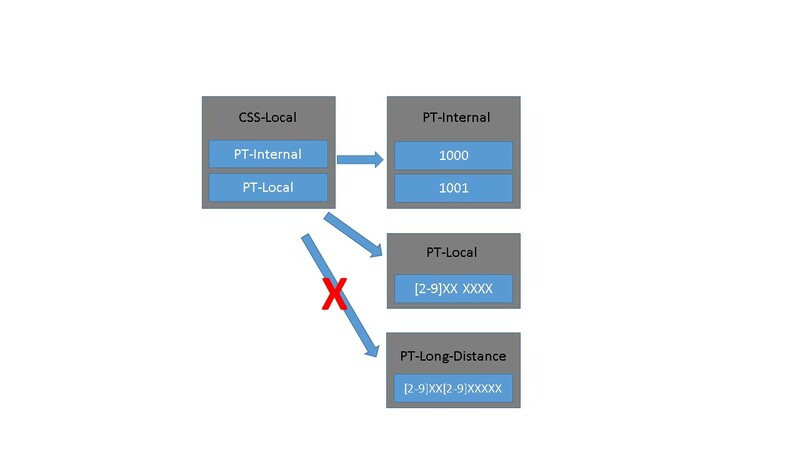 To configure simply select the PT-Internal and PT-Local partitions and add them to the CSS-Local Calling Search Space. That Calling Search Space is then assigned to a phone or line. When a phone places a call the Calling Search Space is compared to the best matching dial pattern from the Partitions in that Search Space containing the dialed pattern. This is depicted below visually. As you can see the CSS-Local Calling Search Space can “look into” the first two Partitions but not the last. This means only internal and local calls are permitted, or in other words, 10 digit and long distance calls are denied. Finally, if you are following along your own system, you may have noticed the option of “none” for Partition and Calling Search Space. To explain this, think of the items and containers from the initial explanation above. If you create a route pattern or DN without putting it in a container do you really need a mechanism to search those containers? Of course not, they are out in the open. This is, of course not very scaleable or flexible but would allow you to create a working configuration. Use of the “none” Partition is not recommended as per Cisco’s documentation. Can the same route pattern or DN exist in a partition? No, if you attempt to add a DN, route pattern, etc to a partition that already has that pattern you will receive an error message. Can I add the same route pattern or DN to two separate partitions? Yes, however, this is not a best practice as per Cisco documentation. The most specific match is the match that is used. In the case of this example a dialed number of 1000. If the patterns match exactly the match from the highest Partition in the Calling Search Space list will be used. The inter digit timeout timer must expire before the call is routed when overlaps occur if the user is dialing a digit at a time. I hope this has been a helpful introduction to Partitions and Calling Search Spaces. Feel free to leave questions below and I will add them to the common questions section. This entry was posted in Collaboration, Telephony and tagged cisco, configuration, CUCM. Bookmark the permalink.